The Chart House in Dana Point is located on a hill overlooking the Harbor. It is a great location and allows panoramic views of the water. Inside, there is a stairway that leads directly down to the bar and restaurant. The decor is a bit outdated but the restrooms look like they have just been renovated. We visited Chart House in September 2006. We started at the bar, which has low seats and televisions that beam football and other sporting events. The lounge area is festive and the service is fast and friendly. It looked like an ideal place for a mid-week happy hour, but we have not tried that yet. It took a bit longer than expected (40 minutes or so) to be seated after arrival. We were both hungry and glad to be transferrred to the dining room. The dining room is circular, open, has glass windows which overlook the ocean and is, overall, unique for Orange County. It reminded Anna Lisa of a space-ship; it reminded Jay of the TV show about the 4 waitresses back in the '80's...(It's a Living). The room had a different feel from other OC restaurants because of its open layout. It is not what we would call a romantic destination - - it is very lively and everyone sees everyone. There are servers walking back and forth all the time. We both thought it was interesting although the carpet and decor scream that they were leftovers from the early 80's. We sat in one of the booths that lined the inner part of the dining room. It was comfortable and made it fun to watch everyone else in the room. Jay had the Spiced Yellowfin Ahi - - Cajun spiced and grilled, ginger soy butter, wasabi cream, spinach & bok choy. He says it was good. If it wasn't for the fact that it felt like we were eating in a spaceship, it would have been a much better dinner. Really, it satisfied him. He says he would recommend this dish, despite it being a standard item on just about every OC menu. 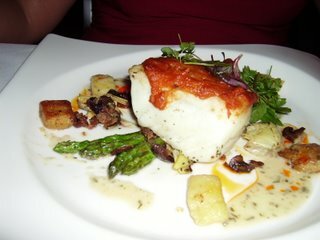 Anna Lisa had the halibut with crabmeat on top. It's not on the web menu but it was absolutely fantastic. 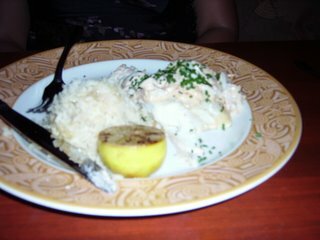 It was very rich and it was almost hard to distinguish the halibut from the crab. The entree was full of flavor and I would definitely get that again. 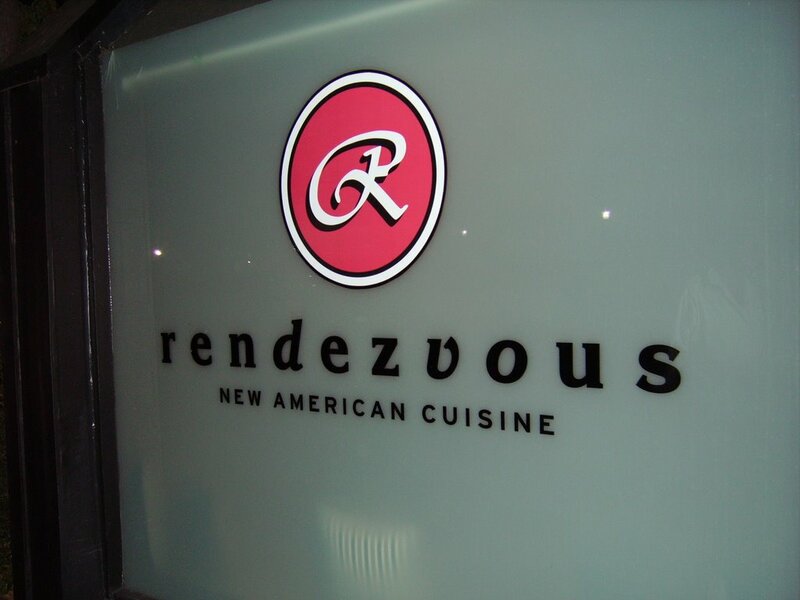 This was our second visit to Rendezvous, the San Juan Capistrano classic restaurant that opened in Fall 2005. It is located at the train depot, next to Sarducci's. As with our first visit, Rendezvous impressed us with the decor - - very New York, DC or Chicago in vibe. It has rich woods on the floor and furnishings and bears the trimmings of a fine dining restaurant. This time around, we started off with the Maryland Blue Crab & Potato Raviolis Crispy Sage & Lemon Brown Butter. 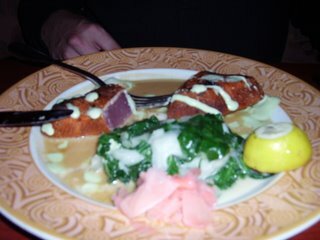 We first visited Rendezvous in November 2005 and recalled having a ravioli appetizer of some sort. We both assumed that this would be substantially similar to the one we enjoyed nearly a year earlier. Although this ravioli dish is good, the pasta was a bit hard and lacked the tenderness that would have made it melt in our mouths. The big crab meat that came with it made up for it though. We brought in a pinot called Iron Horse. It was good. If memory serves, it had coffee and leather flavors, which we realize are unusual for a pinot but there it is. For his entree, Jay went out on a limb and ordered the Chicory Coffee Crusted Bison Rib-Eye Yukon Gold & Green Chile Potato Puree, Wild Mushroom Ragu. 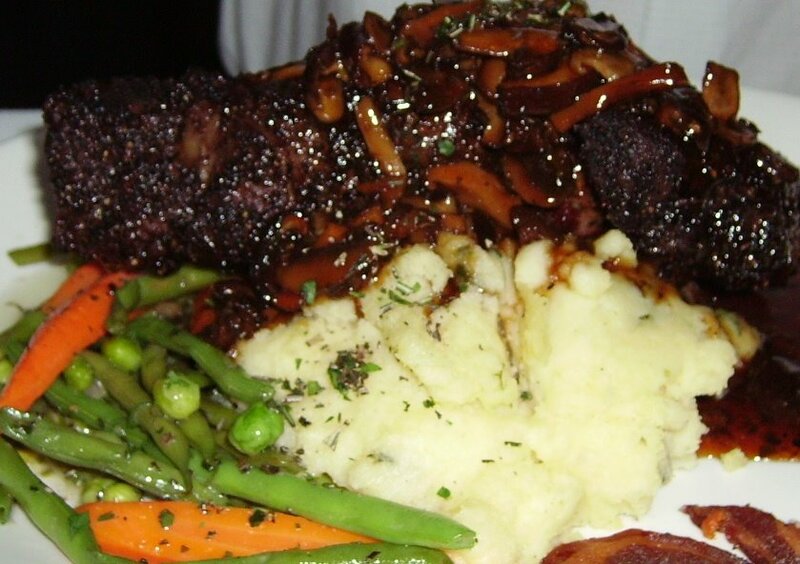 He had read several favorable reviews of this dish and thought it was worth trying. Unfortunately, however, the meat proved too lean and lacked the flavor that the other meat dishes would have provided. He had once ordered the flat iron steak with absolutely no complaints. 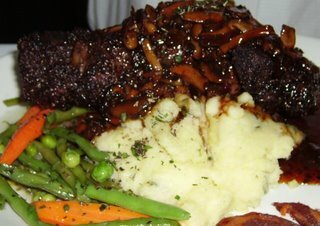 Jay's take on the Bison - - this was a very rough one to handle as he had looked so forward to it: The coffee crust on the meat not only dried it out but evaporated all the flavor from the already too tough and too lean piece of meat. He did not enjoy it at all and sadly, had to let the proprietors know. Anna Lisa selected the Pan Seared Alaskan Halibut Hazelnut Romesco Sauce, Homemade Gnocchi, Asparagus, Baby Artichokes, Wild Mushrooms, Crispy Prosciutto. This was a departure from the usual salmon, shrimp or pasta dishes to which I have limited myself. So I went out on a limb as well, only with a bit more success. The presentation was very colorful and consisted of several segments. It reminded me of a playground with several sections and toys to be tried. The fish was tender, the flavor was mild but the different elements on the plate distracted me enough to give it a favorable review. Would I order it again? Probably not. I will likely try the scallops next time. 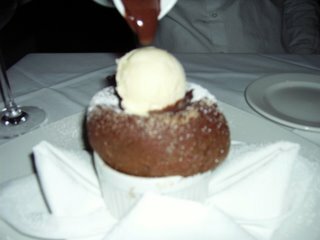 The best part of the evening was desert. But then again, how can anyone trifle with Vintage Chocolate Souffle Home Turned Creole Cream Cheese Ice Cream? We were both saddened to be disappointed by our second visit to Rendezvous. While our first mid-week visit in 2005 was unforgettable, this one, was equally memorable but not for the right reasons.